The classic and contemporary readings in this collection represent the four most influential theories of truth – correspondence, pragmatist, coherence, and deflationary theories. A collection of classic and contemporary philosophical reflections on the nature of truth. 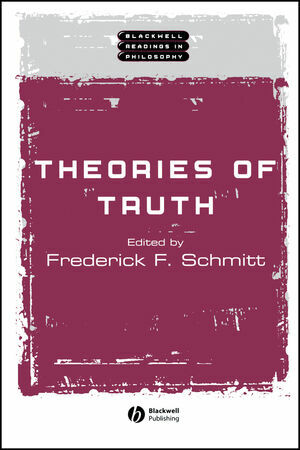 Opens with an introduction to theories of truth, designed for readers with little or no prior knowledge of the subject. Divided into four sections on the most important theories of truth - correspondence, pragmatist, coherence, and deflationary theories. Brings together articles in the recent debate over the correspondence theory and deflationism that are not otherwise available in one place. Includes contributions by C.S. Peirce, William James, Bertrand Russell, Alfred Tarski, Hartry Field, Dorothy Grover, Anil Gupta and others. Concludes with an extensive bibliography of recent articles on truth. Frederick F. Schmitt is Professor of Philosophy at Indiana University. He is the author of Knowledge and Belief (1992), Truth: A Primer (1995), and the editor of Socializing Epistemology (1994) and Socializing Metaphysics (2003). Truth: An Introduction: Frederick F. Schmitt. Part I: Pragmatist Theories of Truth:. 1. How To Make Our Ideas Clear: Charles Sanders Peirce. 2. Pragmatism’s Conception of Truth: William James. Part II: Coherence Theories of Truth:. 3. On the Nature of Truth: Bertrand Russell. 4. In Defense of the Coherence Theory of Truth: Francis Dauer. Part III: Correspondence Theories of Truth:. 5. The Semantic Conception of Truth and the Foundations of Semantics: Alfred Tarski. 6. Tarski’s Theory of Truth: Hartry Field. 7. Truth and Language-World Connections: Dorothy Grover. 8. The Explanatory Role of Correspondence Truth: Philip Kitcher. Part IV: Deflationary Theories of Truth:. 9. A Prosentential Theory of Truth: Dorothy L. Grover, Joseph L. Camp, Jr. and Nuel D. Belnap, Jr.
10. Deflationist Views of Meaning and Content: Hartry Field. Truth: A Bibliography: Kevin Kimble and Frederick F. Schmitt.